Art Review: “Circus!” an all-media group exhibition. Studio Place Arts, Barre. Through July 25. The circus is in town! An all-media group show with the simple title “Circus!” at Studio Place Arts in Barre trumpets the weird and wonderful visual world of the “Greatest Show on Earth.” With about 50 pieces on display, including works with dozens of constituent figurines, SPA’s main gallery is a whirlwind of vibrant colors and exotic forms. Ringmaster Janet Van Fleet orchestrated a loud, gaudy, playful show dominated by sculpture, including three rings of diorama-like installations complete with sawdust. Ruth Hamilton’s “The Gipbot Circus” and Anne Young’s polychrome porcelain “Circus Parade” fill the other two rings. Hamilton sculpted her particolored performers from papier-mâché; aerialists even dance on wires high above the sawdust floor. Young added delicate details to enliven her parade of ornate wagons, elephants and performers. By chance, all three artists’ figures are roughly on the same scale, so the three Lilliputian installations seem more like a single large one. A section of the gallery has been screened off into a mini-sideshow with some creepy displays by Charles Papillo. Papillo collected and lovingly painted dead things, such as an opossum head and a tiny, mummified bird hatchling. All appear in strange glass jars. “Bird Woman,” by Nicholas Hecht, fleshes out the sideshow like a character from Tod Browning’s classic 1932 film Freaks. Hecht’s character has a bald, feminine head and two avian feet that seem to have metamorphosed from human hands. 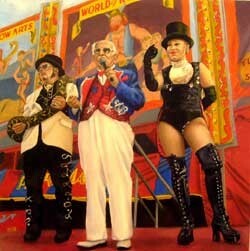 Toni-Lee Sangastiano is an artist with genuine circus credentials as a banner painter. “Pooba Savoring” is one of her four skillfully rendered, realist oils in the exhibition. Pooba is a fire-eating dwarf, and Sangastiano perfectly captures the details of his wrinkled face and costume. “Bally” is the portrait of a sideshow barker and his two assistants. Background details become visual rhythms and expressive patterning in Sangastiano’s works. She’s a masterful painter of strong narratives, presenting people without objectifying them and viewing the circus world from the inside out. Sangastiano’s 2008 oil “Last King of the Sideshow, Ward Hall” shows us the barker from “Bally” at home on his couch, smiling as he pets his cocker spaniel. If it weren’t for his satin red, white and blue star-spangled suit and the over-the-top leopard pattern covering the couch and rug, he’d seem like any other congenial old uncle who just got home from work. Mr. Masterpiece presents a painting entitled “Unelectable.” The former organizer of Burlington’s notorious “Clown Show” for many years has created clowns that careen straight at the viewer. The words “Nader Unelectable at Any Speed,” a takeoff on Ralph Nader’s 1965 exposé of the auto industry Unsafe at Any Speed, are festively scrawled across the canvas. Circuses have been in America for more than 200 years, but in the early 19th century, Vermont was the most staunchly anti-circus state in the Union. The entertainment was just too much for puritanical Yankees to countenance. Then Vermonter Dennison W. Stone, who had run off to become a circus impresario and popular clown, broke the ban with a combination of guile and subterfuge and performed in his home state during the 1840s. Nowadays, SPA’s “Circus!” runs no risk of being fined or run out of town. So step right up, ladies, gentlemen and children of all ages! The wondrous show has begun!